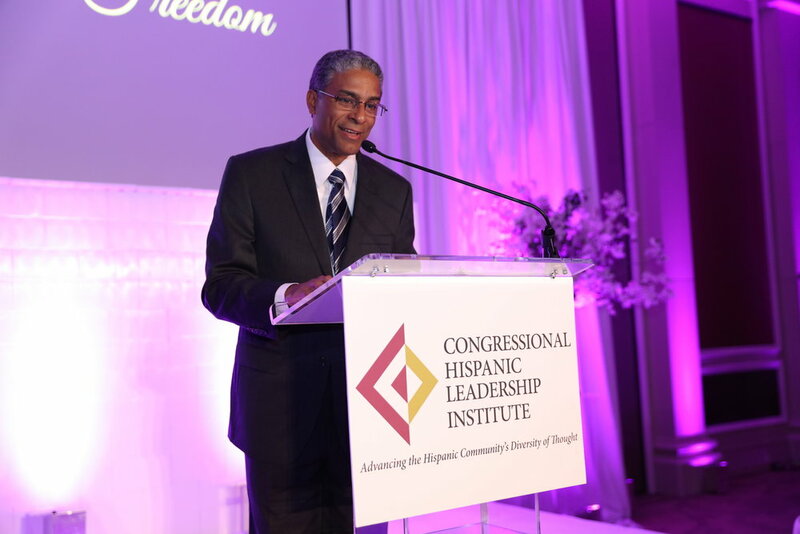 Washington, D.C – The Congressional Hispanic Leadership Institute (CHLI) held its 13th Annual Gala & Leadership Awards: A Tribute to Freedom, on Wednesday, April 26, 2017, at the Mandarin Oriental Hotel in Washington, D.C. CHLI’s celebration of freedom honored two members of Congress, Congressman Rodney Frelinghuysen (R-NJ) and Congressman Gerald "Gerry"Connolly (D-VA), with its Leadership in Public Service Award, and bestowed Presidential Medal of Freedom Recipient, Dr. Oscar Elias Biscet, with CHLI’s Leadership in International Relations Award. CHLI’s President and CEO, Mary Ann Gomez Orta, and CHLI Board Member & Gala Committee Chair, Lauren Robitaille, welcomed the ballroom full of CHLI family, friends, members of Congress, and international dignitaries, and recognized the Gala’s premiere partners: Comcast NBC Universal Telemundo, Coca-Cola, Altria Client Services, Verizon, RAI Services, Heineken USA, and Wal-Mart. Mrs. Gomez Orta recognized CHLI Advisory Council Chairman, Mr. Stephen Halloway, for his support and dedication to the CHLI Global Leaders Program, and presented, on behalf of the CHLI Board, a donation to the ROTC summer camp for two cadets - in Mr. Halloway’s name. CHLI Vice-Chairman, Congressman Mario Diaz-Balart (R-FL), accompanied by CHLI Founder, Congresswoman Ileana Ros-Lehtinen (R-FL), recognized this year’s first honoree, Chairman of the powerful House Committee on Appropriations, Congressman Rodney Frelinghuysen (R-NJ), for his defense of the rights of all and his work for fiscal responsibility and economic growth. "There isn't anyone else more deserving of this public service award than Congressman Frelinghuysen," said Congressman Mario Diaz-Balart. “I am very honored to accept this award. I am committed to advocating on behalf of the Latino and Spanish speaking communities and ensuring the success of all families in New Jersey and across the nation. Thank you for fighting for the advancement of Americans of Hispanic descent. I look forward to continuing to work with members of your community on many prioritiesincluding access to higher education, promoting economic growth and creating jobs, and most importantly, promoting freedom around the world,” assured Congressman Rodney Frelinghuysen. Presenting the second CHLI Leadership in Public Service Award was CHLI Congressional Board Member, Congressman Albio Sires (D-NJ), and CHLI Vice-Chairman, Congressman Henry Cuellar (D-TX). Together they bestowed the award on Congressman Gerald Connolly (D-VA), an outstanding member of the House Committee on Foreign Affairs and a leading voice for human rights throughout the world. "He worked even before being elected to Congress to give a voice to the voiceless,” said Congressman Henry Cuellar. 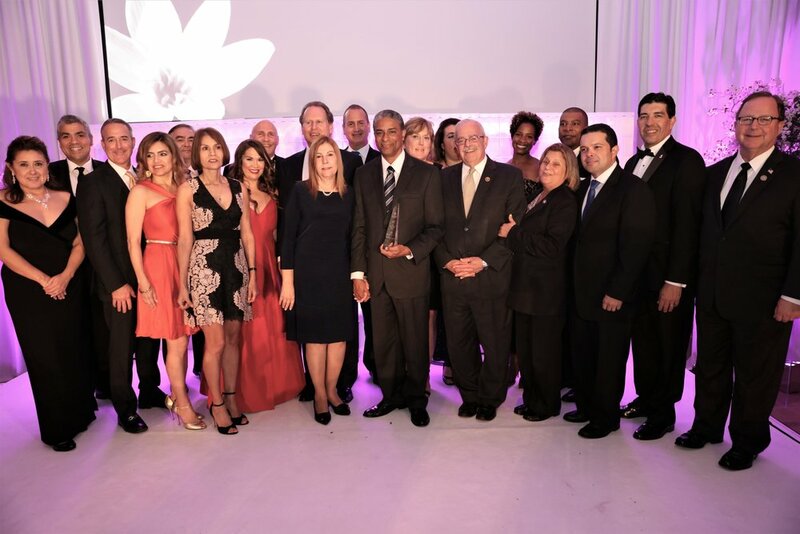 CHLI Founder and Chairman, The Honorable Lincoln Diaz-Balart, presented the 2017 CHLI Leadership in International Relations Award to Presidential Medal of Freedom Recipient, Dr. Oscar Elias Biscet, who on multiple occasions has been imprisoned for his nonviolent pro-democracy work in Cuba. To this day, Dr. Biscet continues his struggle for human rights in Cuba. "He's a symbol. The symbol of Cuba's struggle for freedom and of Cuba’s dignity is this man, Dr. Oscar Elias Biscet,” stated Chairman Lincoln Diaz-Balart. The awards programconcluded with the CHLI Alumni Association President, Eduardo Arabu, Jr., Class of 2010, recognizing the CHLI alumni and current Global Leaders present in the ballroom. Mr. Arabu then formally introduced CHLI Board Member, Juan Otero, who himself started his career in Washington as an intern and is now Vice-President of Federal Government Affairs at Comcast | NBCUniversal | Telemundo. Mr. Otero thanked the guests in attendance for joining CHLI in honoring the extraordinary contributions made by Chairman Frelinghuysen, Congressman Connolly, and for the immense bravery and courage of Dr. Oscar Elias Biscet. CHLI is grateful to all those in attendance and for all those who continue to fight for freedom for all. Thank you for making CHLI’s 13th Annual Gala and Leadership Awards a truly memorable tribute to freedom.